The twins seem to be growing quicker and quicker. I can't believe that they were 5 and 5 1/2 lbs when they were born. I swear that Jake is over 15 lbs now! I remember when they looked so so small in the bathtub ... but now Jake looks like he barely fits in it. And they are out growing their clothes so quickly! All the adorable 3 month outfits we got for Jake won't even come close to fitting on him right now? 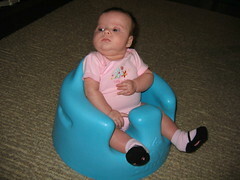 Hailey is still my little peanut, and she is still fitting in her 3 month clothes though ... so that's good. We've had a lot of visitors lately. My cousins came over to see the kids last Friday. They hadn't seen them since the day after they were born, so what a difference! 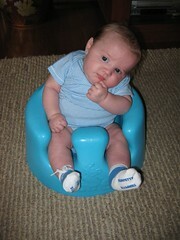 And those Bumbo seats are the funniest things ever! We tried putting the kids in them, and Jakes fat legs barely fit! 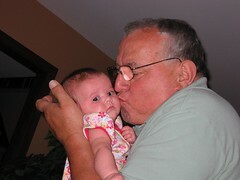 And lastly, here is such a cute picture of Opa (German for Grandpa) kissing Hailey ... I just love it! It's been overwhelming lately. Twins are SO much work. It's just non-stop. And the kids are definitely having more awake time, and they aren't napping on the same schedule, so when one falls asleep, the other one is waking up. I can't wait for the weekends so that Eric is here with me to help out. People always ask me how the heck I feed them at the same time, so I got a picture. 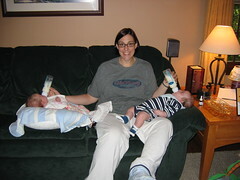 Yes, I do have my hands full. 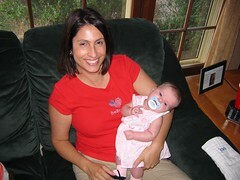 Was life really that bad without kids?? That's a joke. I couldn't love them more if I tried. 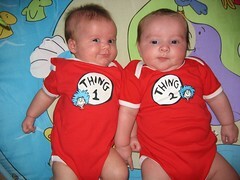 I LOVE the Thing 1 and Thing 2 tees, how adorable! Thanks for blazing the twin trail, I'll have to keep up with you and your cute little babies to see what's in store for me.